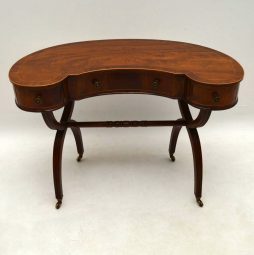 Antique Desks | Interior Boutiques – Antiques for sale and mid century modern furniture, french furniture, antique lighting, retro furniture and danish furniture. 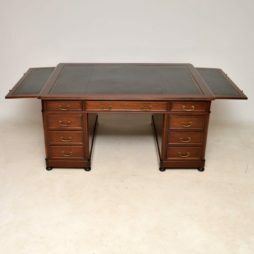 Fine quality antique mahogany partners desk with the original tooled leather writing surface & two pull out slides also with the same tooled leather. 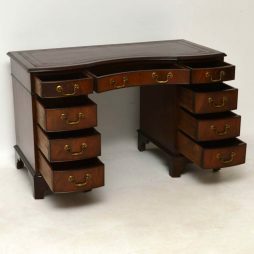 It's a great looking piece & a good sized desk with drawers on both back & front. The drawers have the original brass handles & they all lock with the aid of a central locking system When the central drawers are locked, then all the rest lock at the same time. This desk is identical looking on both sides. It has curved edges, a generous sized kneehole & sits on plinth bases with bun feet. 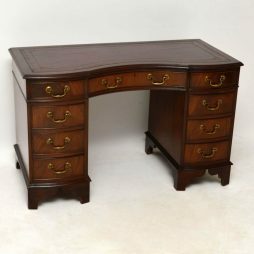 Partners desks of this quality & size are very hard to find. 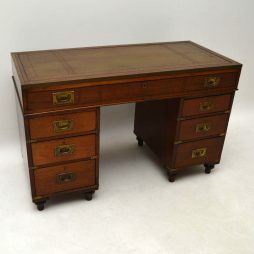 This desk is a really nice example & is in excellent condition having just been French polished. I would date it to around the 1890's period. It's a heavy well made desk & comes apart into three sections for easier transportation. 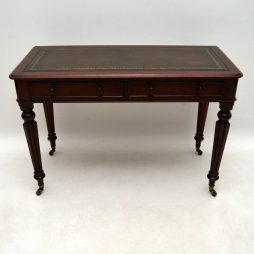 This is a large antique mahogany pedestal desk of high quality & in very good condition. It has graduated drawers to the front, panelled sides & a polished panelled back. The drawers all have original brass handles & locks. The right hand bottom drawer is a double filing drawer & has dividers inside. This desk has a hand coloured tooled leather writing surface with lovely antiqued colours. It has a gadrooned top edge, fluted sides & sits on carved claw & ball feet. The carvings are very good quality. Although quite large, this desk comes apart into three sections, so can be transported very easily. I would date it to around the 1890-1900 period. 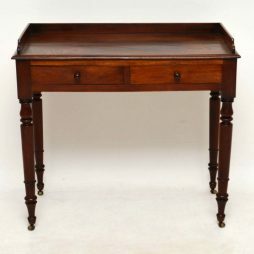 Antique early Victorian mahogany writing table, dressing table or side table. This could have a variety of uses. It’s nice to find one with the original gallery on the top, because these usually go missing. 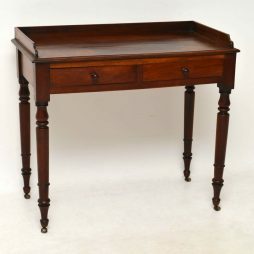 It has a solid mahogany top, two drawers with turned handles & sits on well turned legs with brass casters below. 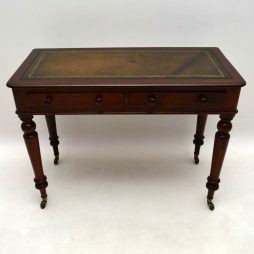 This table dates to around the 1840-60’s period & is in excellent condition. The mahogany has a nice rich colour & a good patina. 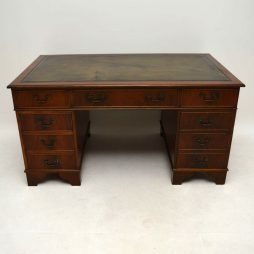 Antique mahogany leather top pedestal desk in lovely condition & with plenty of character. Although this desk isn’t particularly large, it still has a generous knee-hole space, because the drawer sections aren’t too wide. The pedestals are bow fronted & the center drawer section is concaved. It has a finely tooled leather writing surface, which I believe is original & is still in good condition. The top three drawers have locks & all the drawers have the original brass handles. The back is also polished & this desk comes apart into three sections for easy transportation. Fine quality early Victorian writing table from the 1840-60’s period with plenty of character & many nice details. 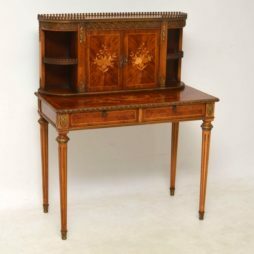 It has a tooled leather writing surface & two drawers below with turned mahogany handles & fine dovetails. It sits on turned fluted legs with brass cupped casters. This is a very good looking desk & is ready for use. 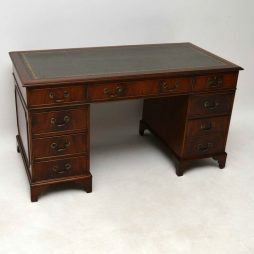 Fine quality antique Georgian III style mahogany pedestal desk with a tooled leather writing surface. It’s all in good condition, having just been re-polshed & I would date it to around the 1950’s period. There are three drawers on the top section with locks & all the drawers have brass handles. The bottom right hand drawer is a double filing drawer. The sides & backs of the pedestals are panelled & it sits on bracket feet. This desk comes apart into three sections for easy transportation. There is also plenty of leg room in the middle. 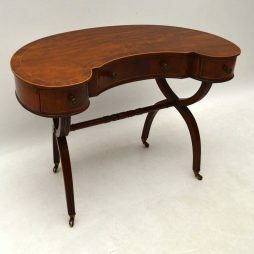 This mahogany kidney shaped table could be used as a desk or dressing table. 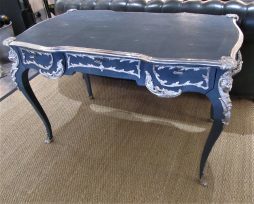 It’s antique, dating from around the 1910 period & is in excellent condition. This piece is also very fine quality. The top has an inlaid cross banded edge. There are three flame mahogany drawers with fine dovetails & brass handles. 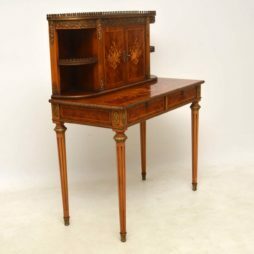 It sits on ‘X’ framed reeded legs that are joined by a turned stretcher & there are brass casters below. 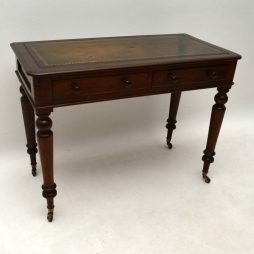 Antique early Victorian mahogany writing table desk in excellent condition & full of character, dating from the 1860’s period. 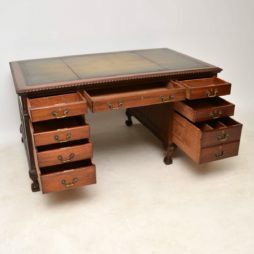 It has a hand coloured tooled leather writing surface & has two drawers with turned bun handles. The legs are boldly turned & have brass cupped casters. 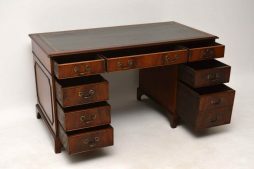 This desk has a very strong look & does have some old markings within the wood, which in my opinion only add to the original look. Please don’t buy this if you like your antiques looking new. 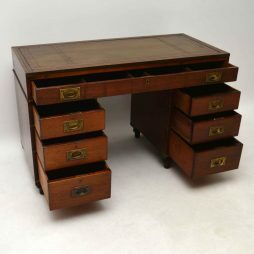 Antique Victorian mahogany Campaign desk in good original condition & full of character, dating to around the 1860’s period. The top section has a tooled leather writing surface & there is a brass edge all around the top. There is one long drawer & each pedestal has three more drawers with inset military handles & locks. The drawers are graduated in depth & the corners of the desk have brass fittings. 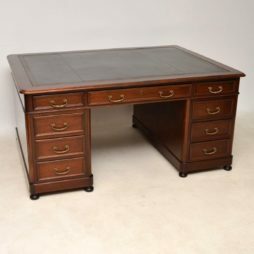 This desk has a polished back, original turned feet & it separates into three sections for easy transportation. Please enlarge all the images to appreciate the fine details, the colour & warmth of this piece. The military brass handles & fittings are all original & are naturally aged. Large antique Georgian style mahogany pedestal desk with a tooled leather writing surface. It’s in good condition, dating to around the 1950’s period. The flame mahogany drawers have brass handles & locks on the three top ones. There is a double filing drawer on the bottom of the right hand pedestal. This desk has panels on the sides & on the backs of the pedestals, which sit on bracket feet. It comes apart into three sections for easy transportation.